All you need is a decent lint roller (the kind with adhesive layers) and a few moments of your time. Simply pack the roller with you when you’re taking a hike or working in brush and roll it on your clothing from time to time. You’ll be shocked to see what you pick up after a short hike. If you want to minimize the risk of ticks hopping onto you as you walk, add some peppermint or lavender essential oil to your regimen. You can spray them on your clothing or rub a tiny amount on your skin topically. If you have very sensitive skin you may want to dilute the peppermint oil with almond or jojoba oil. A slight tingling sensation from the peppermint is normal and nothing to worry about. 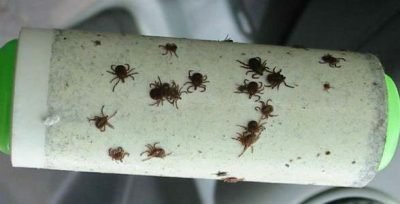 The scent of peppermint and lavender helps to deter ticks, mosquitoes, and black flies but when conditions are unfavorable a lint roller should be used in addition to the oil. Alternatively you could do the same thing with some duct tape wrapped around your hand, sticky side out, but the lint roller is obviously more convenient and easier to manage. 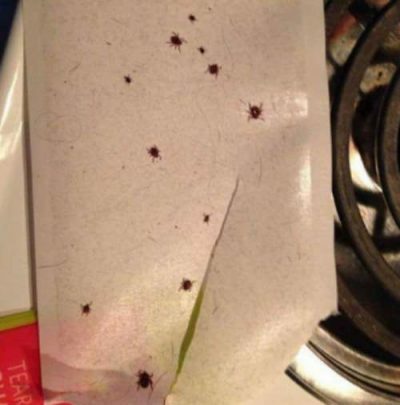 This is definitely a valuable trick to save and share with anyone who likes to spend time outdoors but hates dealing with ticks! 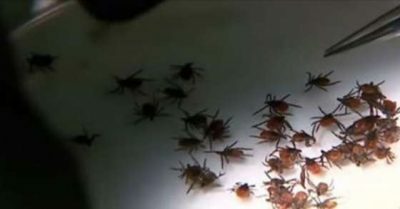 If you’d like to learn how to make a safe natural flea and tick powder for pets you can find that information here.